Take a look at this Floki, ‘Vikings’ Series Supreme Quality Outfit. No Costume Shops in Dallas or North Texas have the quantity, quality and diversity of Dallas Vintage Shop when it comes to Great Costumes and Costume Ideas. We have all of the ‘Vikings’ Series Characters Costumes in stock and we are open all year round. 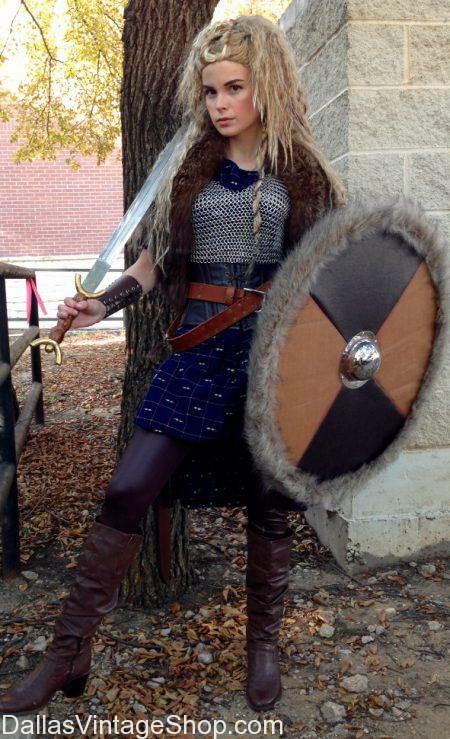 We have Viking Attire, Viking Quality Garb, Viking Theatrical Costumes and Viking Weapons, Wigs, Makeup, Vambraces Jewelry, and other Viking Accessories you have never thought of. Viking Era Character Costumes is only one category of Medieval, Primitive or Fantasy Characters Outfits which you will find in abundance here. Get Complete Costumes & every Imaginable Accessory for Any Period, Any Century, Any Decade and Any Theme all in one place. This Supreme Quality Bjorn Ironside, History Channel’s ‘Vikings,’ Son of Ragnar Lothbrok Costume is just one ‘Vikings” TV Series Main Characters Costumes we have in stock. We have Complete Outfits for all the Sons of Ragnar and all the other Men and Women of Vikings History Channel’s Hit Show. We have all the minute details that make your costume unforgettable. From extras like Wigs, Facial Hair & Makeup to Real or Faux Leather and Fur Garments. We have Theatrical Wardrobes or Individual Complete Costumes, We have High Quality Costumes for Viking Outfits that amaze or we have Economy Adult or Kids School Project Priced Costumes and Costume Accessories. 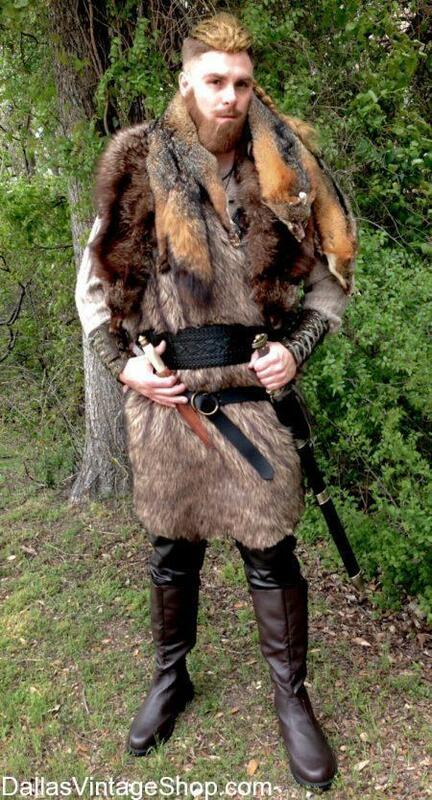 We have the largest selection of Viking or any other Historical Period Attire in the Dallas Area. We are here for you all year round. Meet Lagertha Lothbrok, Viking Warrior Queen, Viking Earl and the Ruler of the Viking City of Kattegat. This Lagertha Lothbrok Costume, inspired by History Channel’s Series ‘Vikings,’ is just one outfit we could assemble for this Legendary Viking Woman. Lagertha Lothbrok the Viking Shieldmaiden was a onetime wife of the famous Viking, Ragnar Lothbrok and she became a ruler of what is now Norway. We have all the Viking Women & Men’s Costumes from the History Channel ‘Vikings,’ Series. We also have any other ‘Vikings’ History Channel Viking Characters Outfits. You will find many Historical or Fictional Vikings Characters in our huge inventory. We have the best quality and the largest selection anywhere in the Dallas, DFW or North Texas Area. We even have wigs, weapons, armor, jewelry and other accessories needed for any of the Vikings TV Series on the History Channel. Get Complete Vikings Characters Outfits or just the pieces you need. We have Supreme, Median & Economy Costumes for Ladies, Men or Children and we are open all year round. Look at our Rollo Sigurdsson Costume for ‘Vikings’ History Channel TV Series Character. We have all your ‘Vikings’ TV Series Characters Costumes. Not only do we have this Rollo Outfit, we have all your Favorite Vikings TV Show Characters Attire. The TV History Channel Vikings Characters are worthy Viking Characters to be emulated. 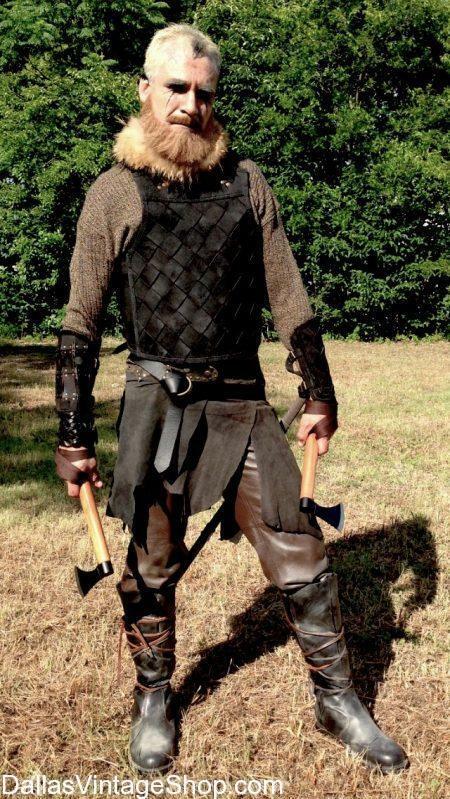 This Rollo Sigurdsson Viking Outfit is just one of this Vikings Character Outfit we can supply for you from our endless supply of Viking Warrior Costumes, Viking Garb, Viking Weapons, Makeup, Viking Beards & Wigs, Viking Vambraces, Jewelry and more. What is your Favorite Rollo Outfit? 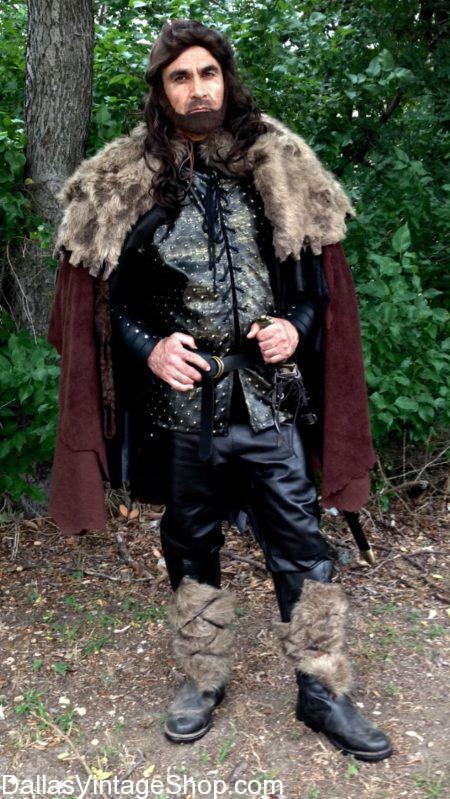 You will find Real or Faux Leather Viking Attire, Real or Faux Fur Viking Clothing and Rugged Fabric Garments, Cloaks, Pants, Tunics and more Viking Costumes & Accessories that would be perfect for any of the History Channel Series Viking Characters. You will find he largest collection of Viking TV Show Characters Costumes and Garb in the Dallas & DFW Area. Get Complete Vikings Series Characters Outfits or just the Accessories you need. There is Supreme Quality or Economy Vikings TV Show Attire for Men, Ladies & Children. Get Theatrical Wardrobes to School Project Costumes, killer Theme Party or Halloween Party Outfits, Renaissance Festival and Medieval Festival Quality Vikings Characters Garb. Don’t forget, we are open all year. This is just one ‘Vikings’ History Channel: Queen Aslaug Viking Queen Costume Idea. We have a number Viking Woman’s Period Costumes for Queen Aslaug, who is daughter of dragon slayer Sigurd and shieldmaiden Brunhilde. Queen Aslaug provided Ragnar Lothbrok with sons prophesized by the Ancient Seer. Get any of the Female Characters from The Vikings Series from our unbelievable collection of Medieval Viking Ladies Garb. 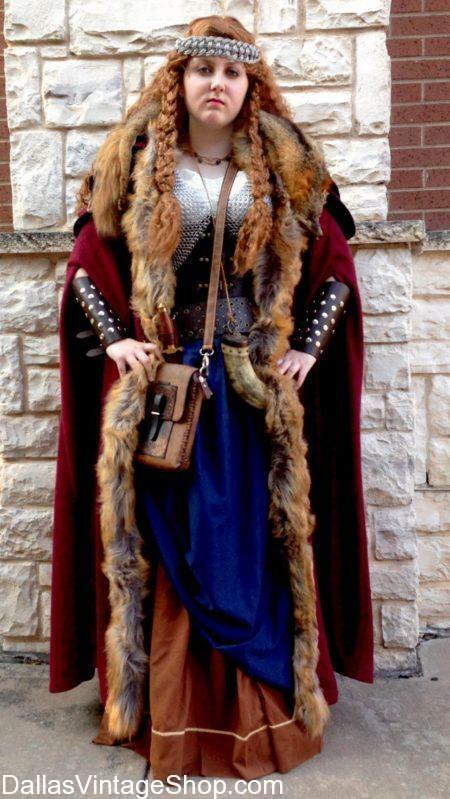 From Viking Slaves, Shield-maidens, Earls & Queens, we have all the History Channel’s Viking Women Characters Costumes & Accessories you need for Theatrical Wardrobes to Medieval & Renaissance Festivals. You are in Vikings Series category.